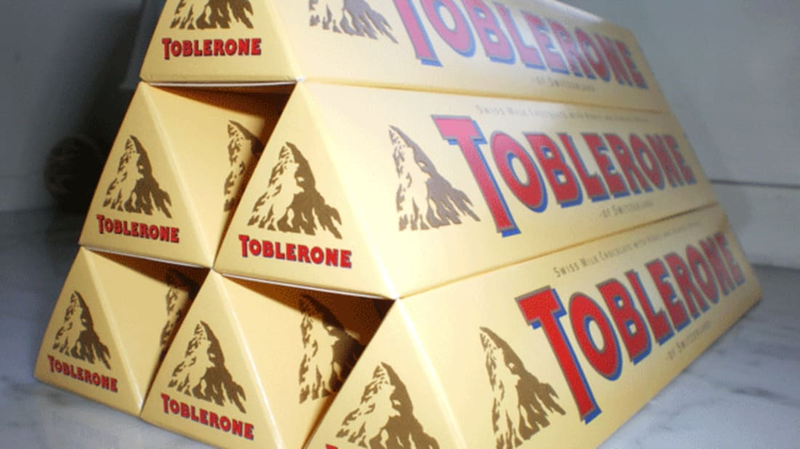 UK fans of the Swiss chocolate bar Toblerone are in for a rude awakening when they peel back the candy’s iconic triangular package: In an effort to cut costs, Toblerone’s makers Mondelez International have redesigned the bar with fewer peaks—and consumers definitely mind the gap. As The Guardian reports, the decision to reduce the weight of their UK product was made in light of rising ingredient prices. Toblerone wrote on their Facebook page: "…to ensure Toblerone remains on-shelf, is affordable and retains the triangular shape, we have had to reduce the weight of just two of our bars in the UK." Those two bars, the 400-gram and the 170-gram, are now 360 grams and 150 grams respectively thanks to large gaps where there were once solid chocolate chunks. Unsurprisingly, Toblerone’s customer base hasn't embraced the change. One Twitter user characterized the redesign as "a chocolate bar of disappointment" while another compared it to a bicycle rack. The classic look, originally meant to evoke the Swiss Alps, is now more reminiscent of Holland in the opinion of one Facebook commenter.